The first is Stained glass artist Jane Littlefield who also writes a creative blog hi-lighting her processes and the classes she teaches. She makes some incredibly rich and colourful art, do check out her classes and website. 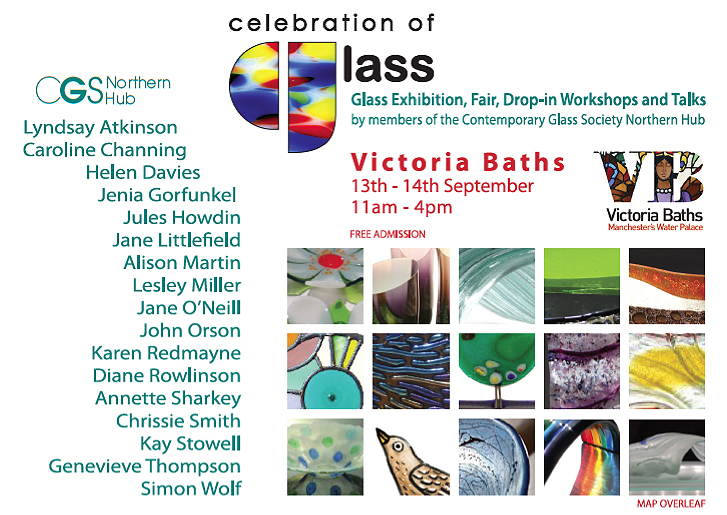 Jane’s involved in a wonderful event at Manchester’s Victoria Baths on September 13th – 14th. You can see more below about who’s exhibiting. The second is a relatively new blogger and friend Lizzie, who’s site, called Dream Discover Italia, is quickly taking off and is all about living in Italy (at the moment Venice). You can gather a sense of it’s culture and local happenings from an English gal abroad ! Wonderfully peppered with interesting photographs and snippets of news and knowledge that she’s gleaned only by being there. 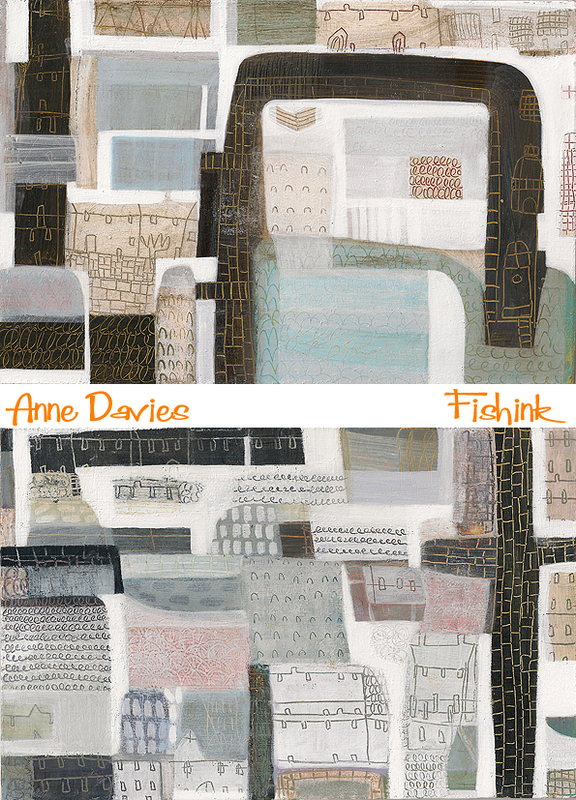 So onto today’s blogpost about Lancashire born Painter Anne Davies who grew up in the Derbyshire Peak District. On completion of a Fine Art Degree at Newcastle University, she embarked upon several projects creating art work with adults and children with special needs. 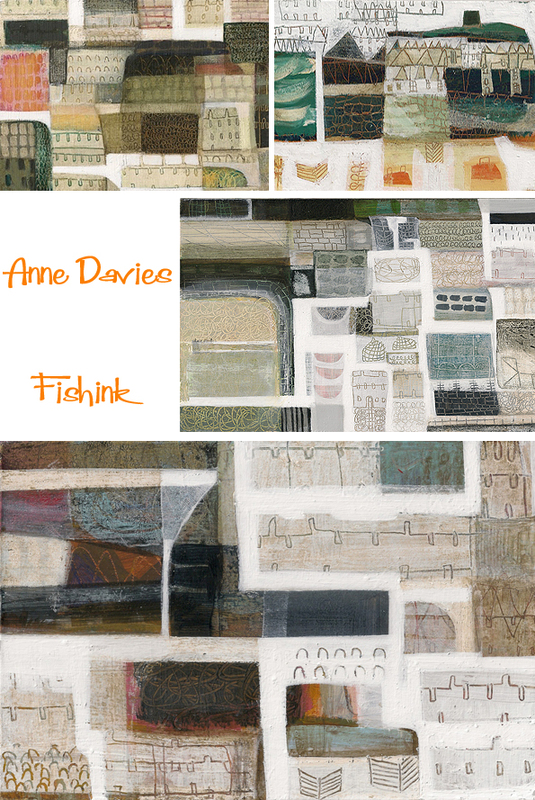 Since she moved to London in 1995 Anne has focused on making and exhibiting her own work. 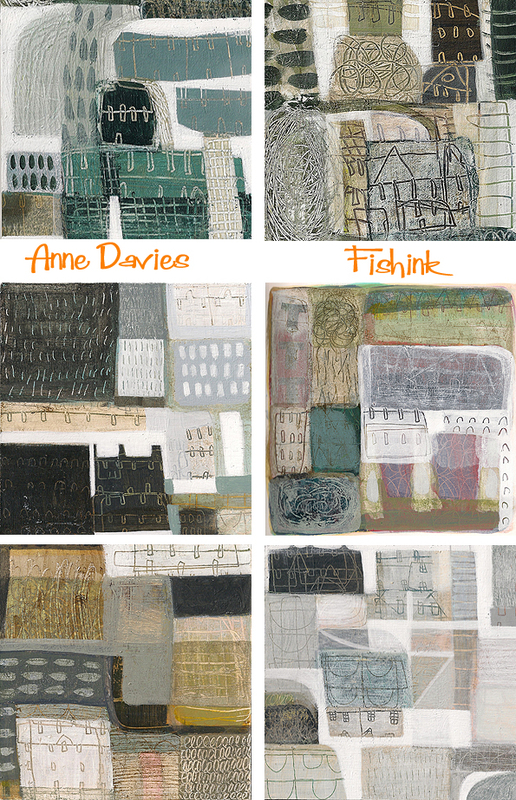 Here’s a little of Anne’s less typical work, the children’s prints are available to buy through Easy Art. 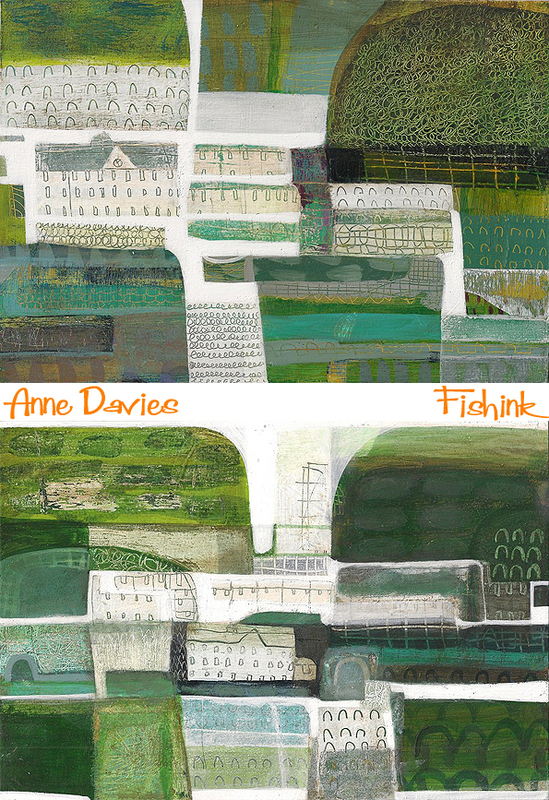 When I saw Anne’s latest work, I was drawn to it for two reasons. Initially, because of it’s beautiful, yet minimal, colour palette and the scratchy, intricate marks. Secondly because the paintings are mostly landscapes from above. Why this aerial view constantly fascinates me I can’t tell you… but it does. 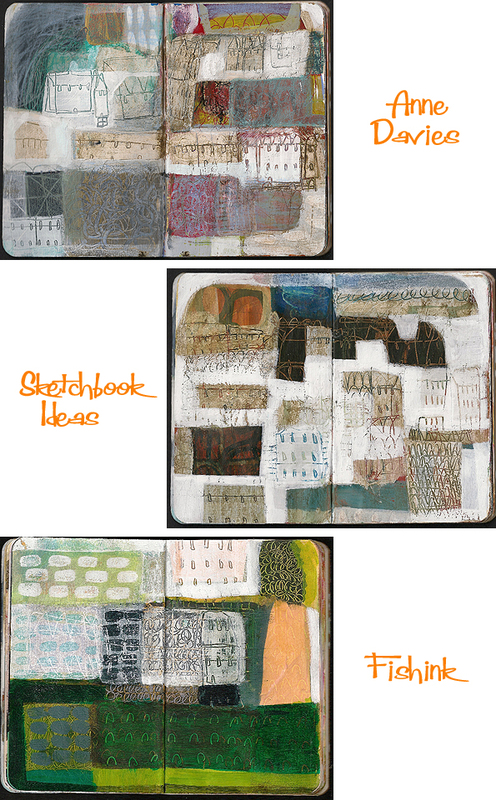 Anne uses her sketchbooks to try out colour combinations and mark make with more freedom. She explains ” I don’t use the resulting images to directly translate into ‘finished’ pieces, this part of my creative process allows me to play with colour and line and experiment with ideas in a less formal way.” I got in touch with Anne to discover more. Can you tell me a little about how your life as an artist came about and how you came to develop your current style of artwork that we can see on your website . I wanted to be an artist since I was at school. I did a degree in Fine Art at Newcastle. I did lot of printing during my time there and always had a strong interest in colour. It wasn’t until after I graduated that I really found my style which comes from a love of landscape, colour and line. I think my time printmaking influenced my painting style, the layers etc. How do you go about creating a new piece of work, do you use elements from your sketchbooks, painting in real environments or from photographs etc ? I draw everyday, usually from my imagination, sometimes from life. I use my sketchbooks as a place to loosen up and mess about with colour. I don’t try to transfer compositions from the sketchbook as that doesn’t work with my style of painting. I start a painting with a very basic composition blocked out and then layer colour, draw into the paint, strip back and edit until I feel the painting is complete. I respond to the painting and things that happen during the process so the painting evolves. The finished composition is usually quite different from the starting point. Although the paintings are usually inspired by particular places they aren’t usually meant to be accurate depictions of a specific scene. They are more about the feeling or memory of a place, the feel of travelling through an environment. The painting takes over and it’s more important to me that it works as a painting than that it looks like a particular place. So elements that would be recognisably of a specific place that start off in the picture might get edited out if they don’t work with the rest of the piece. Your site mentions you working from memories of places in Lancashire, villages and houses etc How do you create using memories in this way ? I think my answer above covers this one too. I love the architecture of the industrial revolution, the way huge mills and rows of terraced workers houses are set into the most beautiful countryside. Both Derbyshire, where I was brought up, and Lancashire where I spent a lot of time as a child are rich in this kind of landscape. Can you give us a rough guess as to how long one painting may take, ie how many layers are laid down to build up the effects that you desire ? They are only small, but for example a 7 x 10 inches piece can take a good five or six hours of focused work because they are so layered. Having said that sometimes things are just flowing well and can be much quicker. There’s something quite intimate about looking at these landscapes. Perhaps it’s just me, but I wonder if the feeling of flying overhead, like in a Chagall painting plays any part in making the viewing of Anne’s work more dreamlike and comforting ? The ghostly white-washed effect in some of your work that you scratch into is lovely. Is this created by a thin layer of acrylic paint that covers the whole canvass and then is sponged off certain parts whist still wet ? What processes do you use to give such an array of ‘peep-through’ effects ? The layers of colour are built up bit by bit. I work on board so it’s very resilient to stripping back and drawing into. Sometimes I will put a layer on and then ‘blot’ it with paper to strip some of it straight back off leaving a very fine layer. I use white to ‘carve out’ space in the picture or add movement and line. Because acrylic drys so quickly I have to work quickly if I want to remove layers or draw into wet paint. I’ve been building this style of working so long now that it has become instinctive and I know how long to leave a particular colour before lifting it to create the effect I want. Don’t you just get drawn into investigating these aerial snapshot views, looking at the streets, fields and tiny details. I’m always drawn to paintings with aerial views, partly because of the perspective and maybe partly because they give me the rare feeling of flying when I look at them. What made you decide to work in this style and were you influenced by other artists (ie Alfred Wallis) etc along the way ? I’ve always loved maps and aerial views. The lines and shapes are interesting to me, the man made marks on the landscape and I like the feeling of taking in whole landscape rather than just one small view of it. I do enjoy the altered perspective of painters like Wallis. It’s more interesting to me, his paintings have more feeling and human warmth in them than traditional landscapes. There are lush green landscapes. But all the time there’s that sense of watching/ hovering over these distant places. What does the future of painting hold for you ? Do you have any aspirations of displaying in bigger galleries or producing a book or other items (cards etc) from your paintings ? If I can continue to paint and enjoy it and make some kind of living out of it I will be happy. It’s always rewarding to have gallery shows and feel you are progressing and reaching more people but it is the painting itself that motivates me. 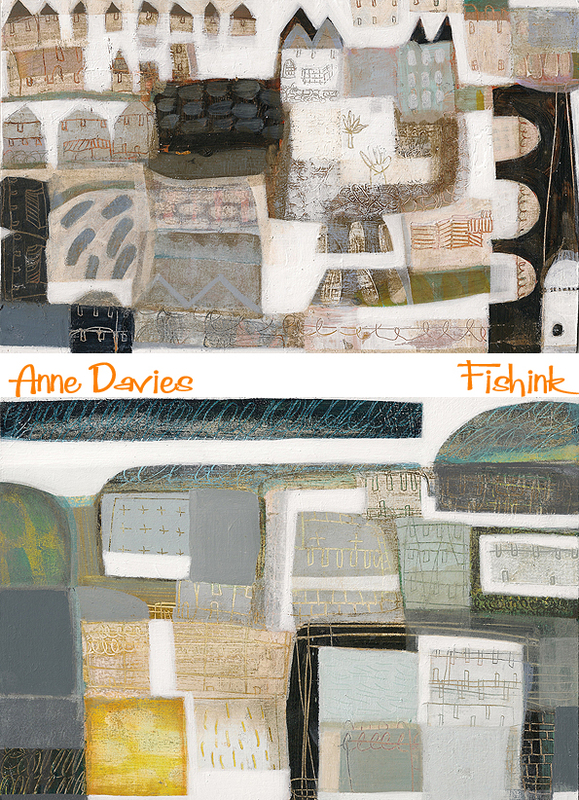 Lovely work Anne and many thanks for your time in answering my questions too. Well wouldn’t you know, we own a Ann Davies!! Love the insights… and the work… presented here. I am presently involved in something a little similar, where the artist Oleg Tishkovets and I put together a simple list of questions that we both have to answer. I’ve found the process illuminating in ways I hadn’t expected. Thanks Clive for your comment. I find it often often enlightening to discover how other artists work. Some great collage pieces on your site too, must explore it some more. I admire Anne’s work a lot and have been curious about her process; thanks for doing the interview! My pleasure Beth. Always great to reveal how different artists work. 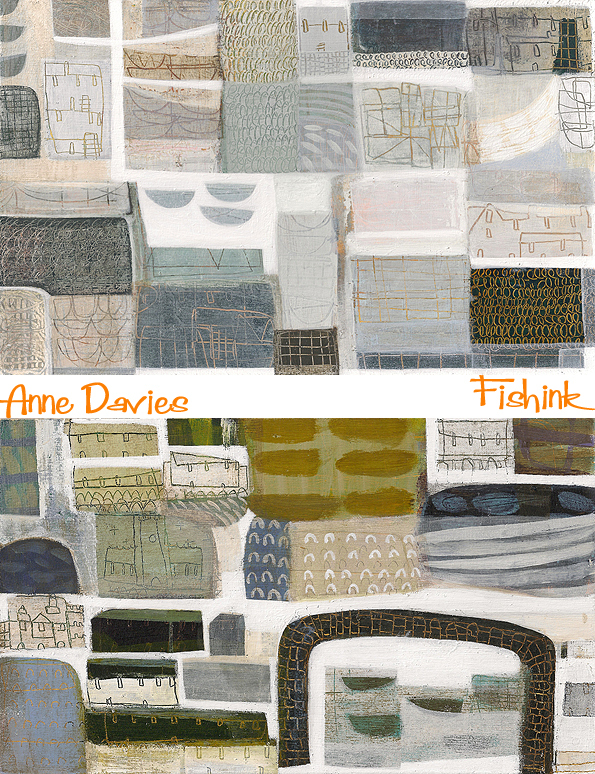 Anne has some wonderful work, thanks for your comments too.